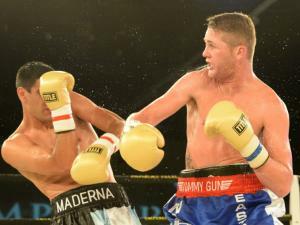 Johannesburg - South African boxers Hekkie Budler and Tommy Oosthuizen retained their IBO titles in contrasting fashion against Argentinian opponents at Emperors Palace on Saturday night. 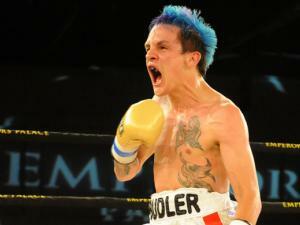 Budler, with his hair dyed a striking sea blue, resembled a rock group member rather than a boxer while outclassing an innocuous Hugo Verchelli in a one-sided, fourth round TKO victory. Referee Stan Christodulu stopped the one-sided minimum weight proceedings after the over-matched Verchelli had been floored on three occasions in the fourth round. Oosthuizen, in contrast, ended his points victory over an articulate, professional Ezequiel Maderna with his face rather than his hair battered black-and-blue. He also sported a raw, bloodied cut on the top of his nose arousing fears that the fight could be stopped by the ring doctor and his super middleweight title snatched from his grasp as a consequence. Despite this, a game Oosthuizen proved his grit and courage by edging out Maderna over 12 closely-contested rounds in which the points victory of the South African was by no means a foregone conclusion. Indeed one of the three judges had the fight as a 114-114 points draw and this seemed a more realistic assessment than that of the two other judges who had Oosthuizen winning by four and five points respectively. In an absorbing, at times drama-filled contest that never reached great heights, Oosthuizen fought for more than half the fight with blood oozing from the cut on his nose following two crunching punches in quick succession from the Argentinian. The South African, ironically, showed more life and endeavour under this handicap when he was stung into action following three tepid rounds at the outset and he may well have been feeling the effects of his battle to make the required super-middlweight limit. Oosthuizen retained his unbeaten record in which he has drawn twice - one of them a lucky decision in his previous fight against Mexican-American Brandon Gonzales. And a fresh assessment might appear to be needed on which direction his future in the ring should now take. Maderna, a medalist at the Olympic Games during his amateur career which has earned him the nickname of “El Olympico”, has now lost two of his 22 bouts, but he made a good impression with his thoughtful repertoire in what was undoubtedly the fight of the night as far as entertainment value was concerned.